When it comes to cooking meals for my family, I try to use recipes that will appeal to everyone and be healthy and delicious. Since we live in the Seattle area, we have great access to salmon at everywhere from our beloved Pike Place Market, to our local specialty grocery stores. I always tell my grandchildren that fish is brain food and the more they eat, the smarter they'll get! And fortunately they like salmon, so we try and eat it once a week either whole, as salmon burgers, or added into a salad. 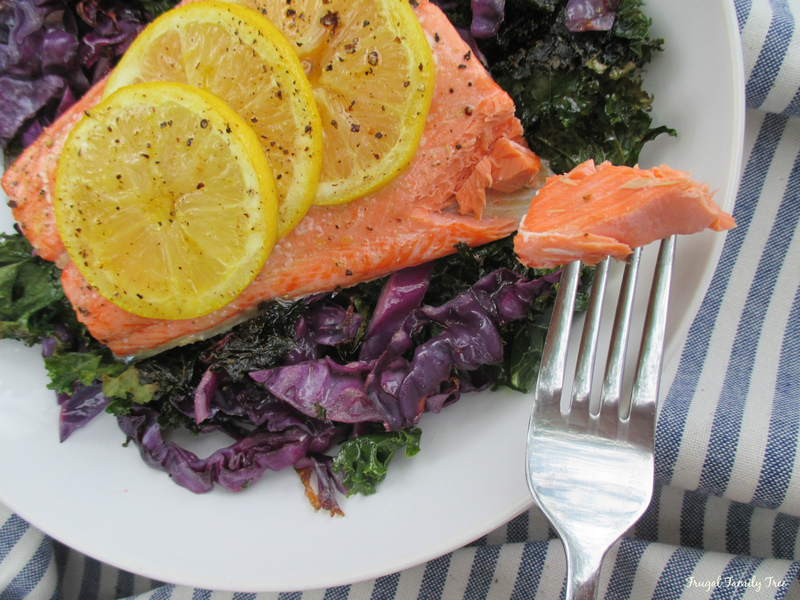 This recipe for Roasted Salmon With Kale and Cabbage brushed with a lemon sauce is a sheet pan supper. Meaning everything was cooked on a baking sheet in the oven. Roasted veggies are a particular favorite for us, and the purple cabbage and kale here cooked up beautifully. I'm really loving sheet pan suppers because they are so quick and easy to make, and clean-up is minimal. It's so important in our house to create meals that include proteins, whole grains, and fruits and vegetables. We try to be conscious of what we cook and eat, and set a good example for the kids. Having healthy foods in the fridge and pantry has dramatically cut down on the snacking we used to do of all kinds of junk food. 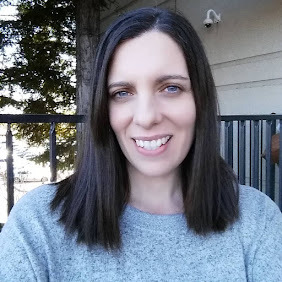 While I love feeding my family meals made with delicious, whole ingredients, it's just as important for our dog to experience the benefits of nutritious eating as well. 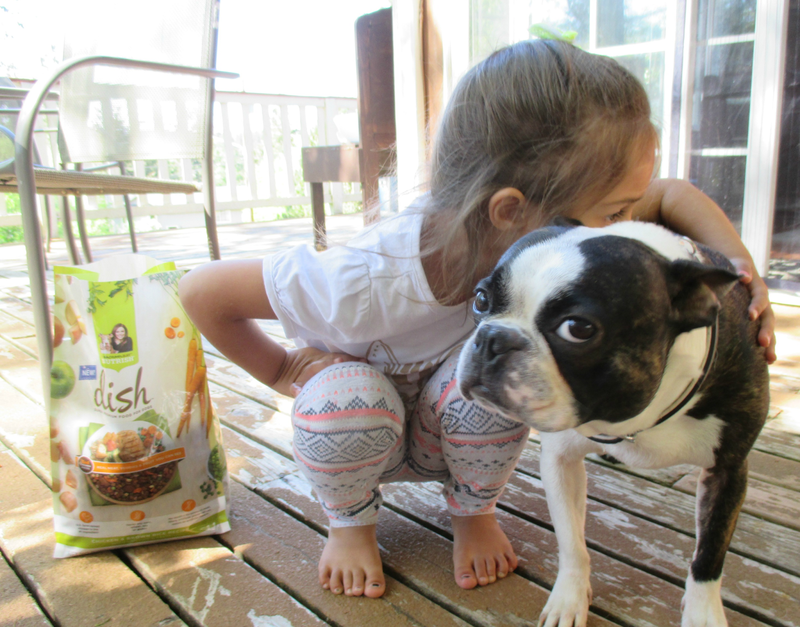 The pets we love and share our lives with need foods made with real, whole ingredients, too. 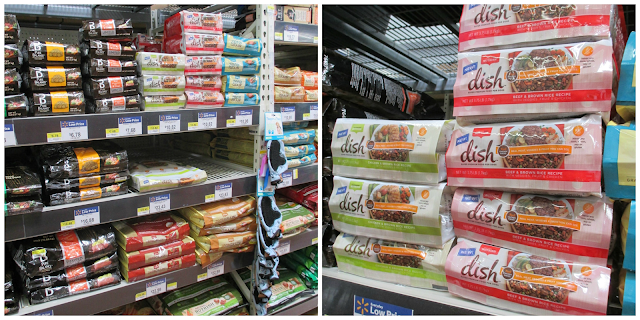 That's why my family and I decided to make the switch to DISH from Rachel Ray™ Nutrish® for our sweet pup, Chewy. 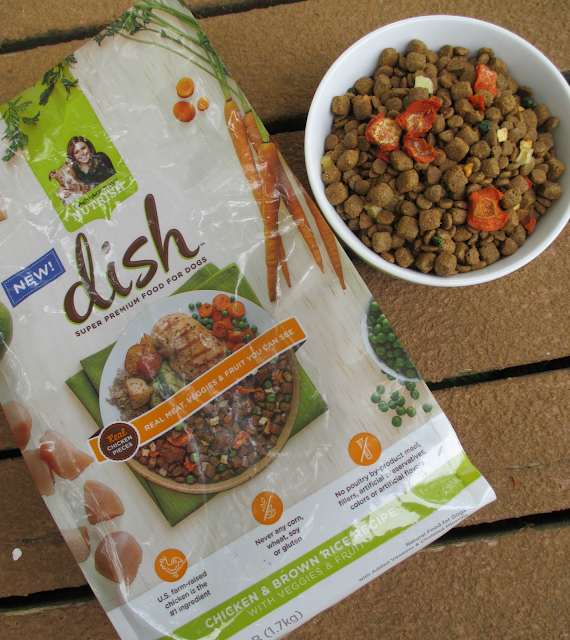 In 2007, with help from pet nutrition experts, Rachael Ray created Nutrish super-premium food and treats for dogs inspired by recipes from her own kitchen. Each DISH dog food formula includes real chicken pieces, crisp carrots, garden and field peas, farm grown potatoes, and tree ripened apples. I feel good giving him a dog food that was made with so much concern for the heath and lives of our animals. Chewy has really loved trying out the DISH Chicken & Brown Rice Recipe with Veggies & Fruit. He can be a picky eater, so I was really glad that he liked this food right away. There is also DISH Beef & Brown Rice Recipe with Veggies, Fruit & Chicken available. Both are made for dogs of all sizes, and are naturally gluten-free. Rachael Ray's personal proceeds go to Rachael’s Rescue, which was created to help shelter pets in need. To date, she has donated over $10MM. This money has gone toward food, medical supplies and treatments for these animals in desperate need. I've always liked and admired Rachael Ray, and for her to help shelter pets in this magnitude really warms my heart. 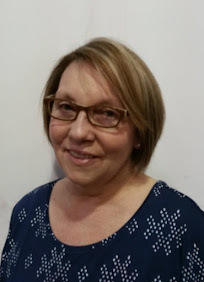 So not only are you feeding your pet a wonderful food for dogs when you buy DISH from Rachael Ray™ Nutrish®, you are helping to save and improve the lives of other animals. store locator to find a convenient retailer. There's also a printable money saving coupon available for you to use too. We have had Chewy for over three years now, and he's a true member of the family. My granddaughter Ashley adores him, and so do my two grandsons, Jayden and Liam. He patiently waits for them in the window when they leave for school everyday, and greets them with licks and wags of his tiny tail when they get home. We always say we couldn't ask for a better dog. He's loyal and loving, and even tolerates it when Ashley decides he needs to wear her ballet tutu. And did I mention Chewy gets his own birthday party every year? It's a fun tradition we started because the kids said he deserved a party too. 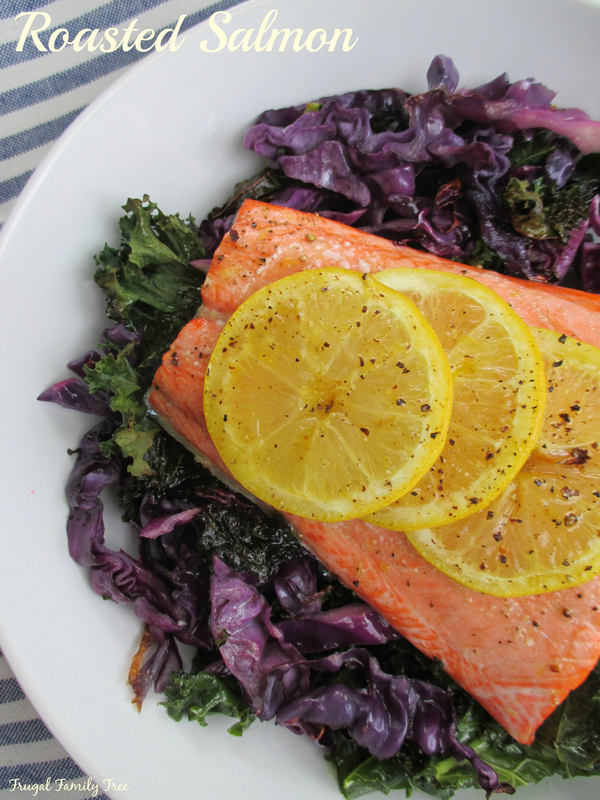 So, to make the roasted salmon with kale and cabbage, you're going to toss together the two veggies with some olive oil and salt and pepper. Bake it at 450 degrees, which seems like a very temperature, but it works. 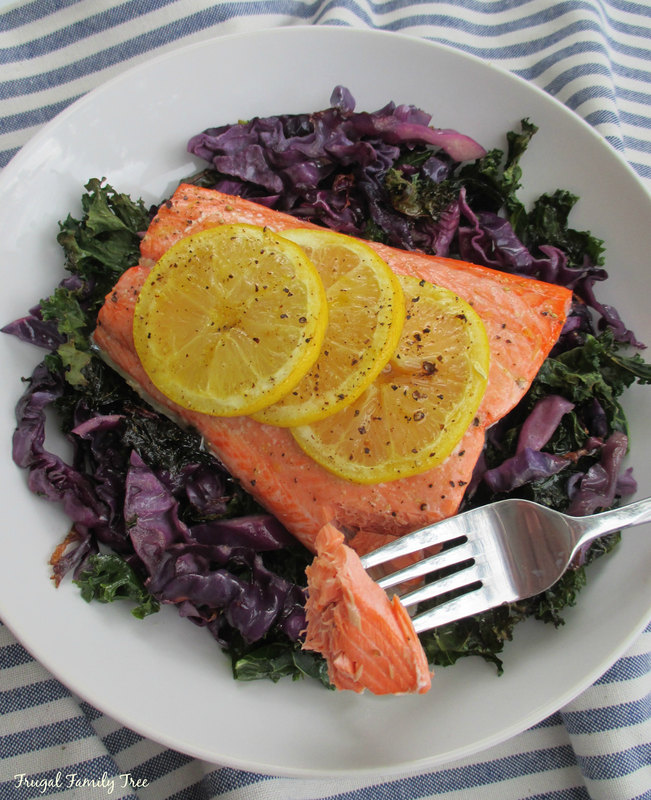 Then you want to pull the kale and cabbage out of the oven and add the salmon fillet. Season it with salt and pepper, then arrange lemon slices on top and pop back in the oven for 10 minutes. This recipe is super easy, and only one pan to wash when you're done. I love cooking, but not the cleaning up afterwards. After it's done, brush on a simple to make lemon and Dijon mustard sauce. I brush it on the salmon right out of the oven, and then again just before I serve it. The lemon really brings out the flavor of the salmon and makes it moist. On a rimmed baking sheet, toss together kale and cabbage with 3 tablespoons olive oil, and salt and pepper. Bake 8 minutes. Remove from oven and stir veggies. Season salmon with salt and pepper and arrange lemon slices on top. Add salmon back to the baking sheet. Put back in the oven and bake for 10 minutes, or until salmon is cooked through. Meanwhile, in a small bowl, whisk together all lemon sauce ingredients. When salmon is done, brush on sauce generously, and once again just before serving. You can find Rachael Ray™ Nutrish® DISH in the pet food aisle at Walmart, and available in two flavors. You can learn more about Rachael Ray™ Nutrish® DISH on Facebook, Twitter and Instagram.